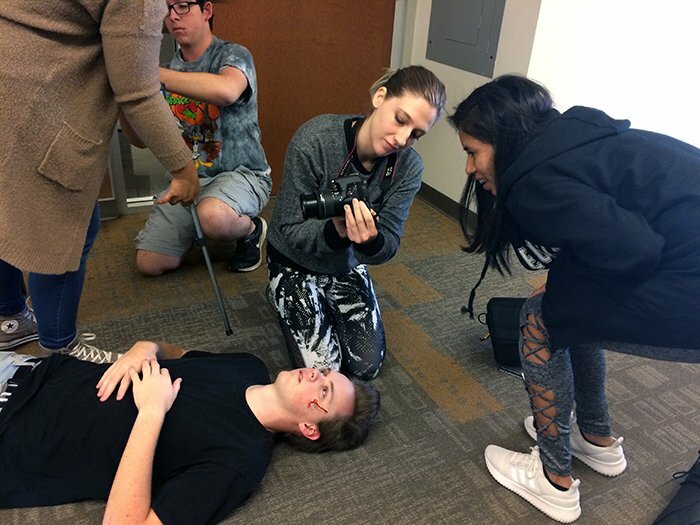 Forensic science students on Thursday used photography to document mock crime scenes in Dr. Melissa Beddow’s Forensic Photography and Reconstruction class. The body lay still in the brightly-lit hallway, a round bruise evident on her arm, faded purple and yellow in color. On her cheek, a crescent-shaped bruise whispered its story to Alicia Bacab, who quietly stood over the body, taking in the evidence and then putting a camera gingerly to her eye to document the bruises, the body’s position and the body’s distance from the wall. She circled the victim, snapping pictures, then stopping so her partner could place a photo documentation scale along the bruises to mark their size — a vital detail they will save for later. It was like a scene out of “CSI” on Thursday on the fourth floor of the College of Humanities and Social Sciences, when multiple crime scenes came to life as six theater students from the College of Fine Arts and Production turned in unusual performances – as fatal crime victims – so forensic science students could photographically document the bodies for a class project. “We are practicing taking photographs of bodies and wounds,” said Dr. Melissa Beddow, assistant professor of forensic science. The activity was part of her Forensic Photography and Reconstruction class. 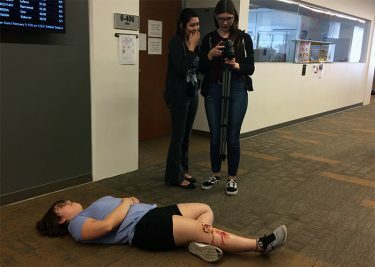 “This is the first time this class is running,” said Beddow of the recent addition to the bachelor of science degree in forensic science curriculum in the College of Science, Engineering and Technology, and so it was the first time she oversaw these crime scene vignettes, acted out by GCU’s own theater students. Beddow contacted COFAP Dean Claude Pensis to see if he could gather a few theater students to really bring these crime scenes to life. The department was more than happy to help out in the collaboration between the fine arts and sciences. “I let them do whatever they wanted, whether it was a wound or giant gash,” Beddow said of the “injuries,” applied by theater makeup, to the actors. She said her professors reached out to the theater students: “It sounded like something cool and fun,” she said of the activity, and spent about 45 minutes lying on the ground, a fake gash painted across her neck as forensic science students pulled out tripods and cameras, took closeups and framed overview shots. The College of Fine Arts and Production’s theater students portrayed fatal crime victims. Bacab, a junior forensic science major, said, “Our job is to document where the wounds and bruises are in relation to the body itself.” She added, the students also had to document the body and its relation to the walls or other nearby structures. Students used photo documentation scales, a type of ruler used by forensic analysts, to measure the size of the injuries. “When you do a reconstruction, you try to figure out the things that may have been used to hit them,” she said. One bruise on the body she was analyzing looked to her like it was the size of a fist, while the curved bruise on her “victim’s” face could indicate “someone hit her from an angle,” she said. The students also took note of the color of the bruises. “You see how yellow they are?” Bacab said, which usually indicates they are older injuries. Documenting all these injuries and taking note of the body placement, “It’ll help us put together what possibly might have happened,” she said. Students were instructed to take seven overall body shots and five pictures of each wound. They took photos of the body’s right side, the left side, toe to head, then head to toe. Hannah Lenthall, a sophomore forensic science major, is getting her experience not only in Beddow’s class but as an intern at the Maricopa County Medical Examiners Office. “The photos they’re taking are exactly what we’re taking,” she said of the crime scene photos she sees at her internship job. Beddow said police departments, depending on the department, can employ their own police crime scene photographers or use crime scene analysts, a job her students might find themselves doing one day. Did Lenthall ever think she would have to know how to take pictures when she decided to major in forensic science? Yes, she said, though she and her fellow students said the kind of photographs they are taking are far from landscapes. Lenthall rattled off the cardinal rules to follow when taking crime scene photos: “We have to fill the frame and make sure everything in our photo is something we want to document,” she said. “I don’t want to get my feet in the photo,” one of the students said with a laugh. Contact GCU senior writer Lana Sweeten-Shults at lana.sweeten-shults@gcu.edu. Follow her on Twitter @LanaSweetenShul.